It’s Bloodline Bandra men, bleddy bugger! I was tuned in to Radio One, as usual, that morning. 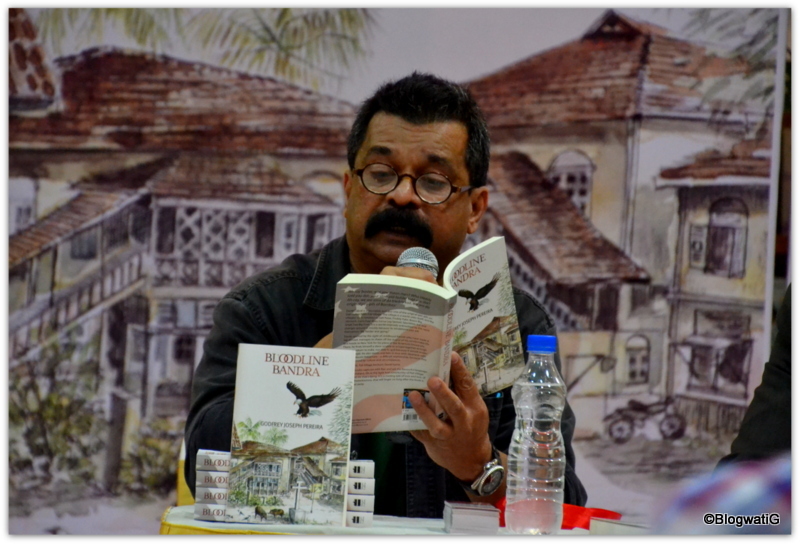 Hrishikay welcomed his guest, an author, Godfrey Joseph Pereira. Two minutes into the conversation, I was hooked on to his book Bloodline Bandra and his people stories. He talked about the East Indians, a community I interacted with, almost, on a daily basis, and of Pali village, a place that I had frequented in college days of yore. He spoke about the American dream and how ‘going abroad’ was the carrot religiously craved for in most catholic homes. He spoke about the bastardization of Her Majesty’s language, and how East Indian English is peculiar to cat-licks. Yes, it seemed like a book I would love to devour. 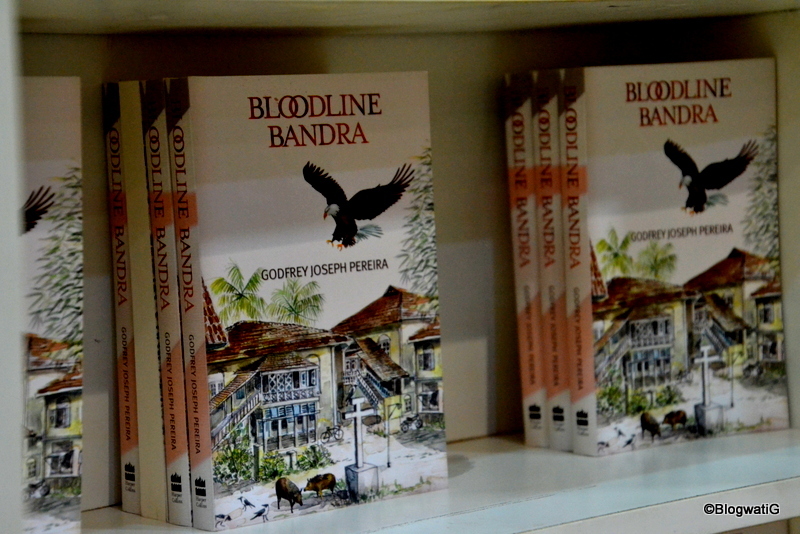 What’s more, Bloodline Bandra was being launched right in my backyard. I decided to visit the Bandra bugger. At an intimate gathering of book lovers, and friends at the Landmark bookstore, Godfrey Joseph Pereira spoke about David Cabral, an East Indian journalist. Bloodline Bandra traces David’s journey right from the filthy by-lanes of Pali to the suave streets of New York. It talks about the myth of living abroad, and the perils of leaving behind the only life that you know for one that you can’t imagine. During conversation, the pain that was writ on Godfrey’s face was unmistakable as he vehemently kept questioning the audience as to why would someone stoop to inhuman levels, especially their own countrymen. There were no answers. I needed to know the reason for the question. I picked a signed copy of the book. All I wanted now was to be home, reading. The cover artwork has quaint one storey houses set in the idyllic Pali Village. The tiled roofs, wooden staircases and limestone walls that have seen much, are an epitome of an era gone by. There is a crucifix, synonymous with Christian communities, right in the middle of the road. Hungry crows and pigs that roam freely complete the picture. The only thing out of place is the American eagle that is swooping over the landscape. Interesting. The single page prologue got me straight into the boxing arena. “HUT, Men, shaddap your mouth. Shee baba, bleddy stoopid bugger, saying same, same thing, every day, men.” The opening lines made me smile. Book I begins with a picture of ‘donn dukkar’ (two pigs in Konkani) from the cover page. The first chapter is a lesson in history of how ‘conversions’ gave rise to a new community. And if history were ever taught like this, I am sure we would find more takers for the subject. From there on it is a roller coaster ride into the East Indian community that, incidentally, resides on the Western shores of the country. Godfrey has scripted the nuances with such delectable humour, I was smirking all through. Right from the vindaloo paste and bottle masala to the hurried ‘Hail Marys’ and rubber slippers, Godfrey manages to elicit a smile every time. The bleddy buggers and the names of their fadders and mudders – believe me I am trying very hard not to give out spoilers here. Even if you are a novice, as far as the dialect is concerned, the book grows on you. However, you have to tune your reading according to the pace it offers. You have to give David time to be the laid back cat-lick that he is. You have to make room for all, right from the Gulf returned fellas, to the nick names of the villagers, the open obscenity and the secret gossip. You have to breathe in a Bombay that now exists only in faint memories of old, tired eyes that have witnessed the years. Hence, you can’t breeze through Bloodline Bandra. You have to savour each page. And then the shift happens with the arrival of the H1-B visa. You are forewarned with the menacing bald eagle announcing the start of Book II. You wonder what’s in store, but you could never put a finger to it. The first thing that changes when David crosses the seven seas, the Indian name is Americanized. So Gurcharan becomes Gary because of pronunciation problems. But Arnold Schwarzenegger never had these issues in Uncle Sam’s territory, remarks David. Excellent point, me thinks. From there on, the big apple simply draws him into its vortex, barely giving him a chance to breathe. Keeping him alive all the same, almost. The desire for opportunities and a better life turn out to be the very manacles that shackle him like a corporate slave. He lives in a no man’s land, theoretically. The American illusion comes crashing down, thanks to his own fellowmen. Caught between the devil and the deep blue sea, David Cabral has no option but to succumb to his fate to stay alive. Hatsumi Nakamura, a Japanese cello player turns out to be the air that he breathes. David survives only to be broken, drawn into addiction, bordering on suicidal and eventually being jobless and homeless. Yes, America proves to be an expensive country, as he was told. The crucifix announcing book III could mean anything, maybe the end, or a glorious resurrection. Yet, the story line offers no respite to David. It is déjà vu with a sinister plot lurking in the backdrop. And with the onslaught of nature’s fury and destiny’s sleight of hand, nothing but divine intervention can salvage the situation. Will David Cabral get out of this alive? Or will he simply cross over to the other side? What happens to Hatsumi? Does the bloodline of Bandra languish on foreign shores? For all this you will have to read the book. 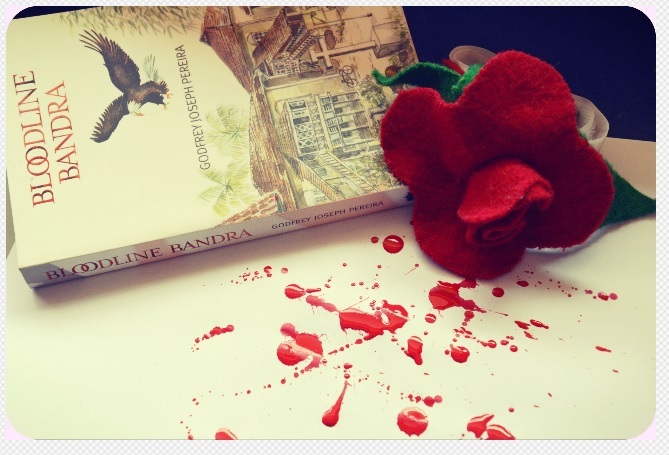 Bloodline Bandra is a delightful read. True to the core, giving you a bird’s eye view of two parallel words across three book volumes. This could have been anybody’s story, and hence it resonates. Godfrey, a journalist himself, shows off his writing prowess in the setting, the characters and the treatment of the story line. A special mention for the high point of every chapter ending. It keeps you glued with ‘what next’. Yes, it is semi-autobiographical to an extent. But he has managed to stay true to the tale he is telling. His choice of words and phrases are like reminiscing the lyrics of a song you used to know. Warm, inviting and comfortable. Just right. Like a glass of wine. This book is a wholesome effort. Right from the cover to the interview at the end. It gives the reader an added window into the world of the author and his thoughts as to how this book came about. I loved, especially, because I relate to the ‘mack’ imagery of the artwork. The research done on the East Indian language is extensive and it shows. The only thing I missed was him talking about the ‘Umracha Paani’ in detail. It is a wedding ritual that does find mention in the book, but more for the musical instrument used at the soiree. Also, categorically missing was ‘I akksed him’ the typical pronunciation of the verb. Otherwise, I have little to complain about. Well, maybe I am biased, too, because it is Bombay. So what men? We are toh bleddy like dat wonly! Your fadder wot going?